Coral Rose - Gulf View! Seacrest Beach! 30A! Private Pool! Steps to the Beach! Beautiful white sandy beaches, emerald green ocean water, private swimming pool, great shopping and fantastic restaurants...what more can you ask for? Come stay at Coral Rose and experience an unforgettable vacation that you will want to repeat year after year. Sitting on the north side of scenic County Road 30-A you will be facing the beautiful water and beaches of the Gulf of Mexico. We are located in between two public beach accesses; 200 yards in either direction. We are just a bike ride away from the beautiful towns of Rosemary Beach and Seaside Beach. With 3 bedrooms and 3 bathrooms this beautifully decorated house sleeps 10 comfortably. From the moment you pull up you will know you're in for a real treat. Pull open the blinds, let the sea wind blow through your hair and enjoy the breath taking ocean view from either the lower level kitchen balcony or the second floor front bedroom balcony. Either way these balconies will quickly become your favorite place for early morning coffee or sunset cocktails. Coral Rose also offers a private pool perfect for swimming, laying out or a quick dip after returning from the beach, which is merely a short walk across the street. For those traveling with young children, grandparents or sun shy vacationers the pool area also offers a large overhang perfect for participating in activities without soaking up the sun. Complete with charcoal grill and picnic table this is a fabulous area for outdoor dining. Coral Rose is conveniently located between Destin and Panama City Beach. 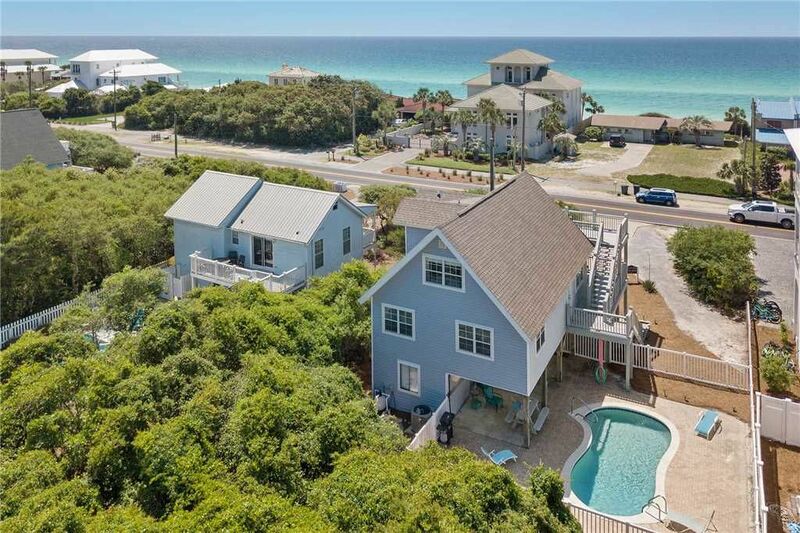 With Grayton Beach, Seaside, Water Colors, Water Sound and Rosemary Beach only short walks, bike rides, or drives away. During your stay at Coral Rose you will be surrounded by amazing restaurants that offer the freshest seafood straight from the Gulf. You can choose from casual to fine dining depending on your mood or visit one of the many fresh seafood markets to cook at home. With Coral Rose being located between Destin and Panama City Beach you have your choice of either shopping at Silver Sands Outlet Mall or the new Pier Park. Silver Sands offers many name brand stores with great outlet prices, while Pier Park offers name brands and unique locally owned stores. Pier Park also offers a variety of restaurants from Jimmy Buffett's Margaritaville to The Hofbrao House, Reggae J's, The Back Porch and many many more. Two balconies perfect for outdoor living. Private pool with large over hang great for children or those shy of the sun! Very relaxing. The home definitely needs updating. The mattresses were extremely uncomfortable. The HVAC system is insufficient for the home. The upstairs is very hot. The water bugs were excessive. I appreciated the location to the beach access and the personal pool. Clarence, We appreciate the feedback. Please let us know when you would like to return! The property was clean and very close to the beach. Only issues we had were the ants and bees near the pool. Other than that Tuesday was great. The staff was nice, the house had lots of kitchen equipment and lots of towels! We had plenty of space for our party of 9 + baby. I would definitely recommend this property. Thank you for your feedback, sorry about the ants and bees outside, we'll be sure to look into that! We hope your travels bring you back to "Coral Rose" by Ocean Reef Resorts soon! House was more rustic than the pictures depicted, but overall it was adequate. Enjoyed the private pool and easy access to beach. Denise, thanks for staying with us. We are glad to hear that you enjoyed your stay. Please contact us when you are ready to return to Coral Rose by Ocean Reef! Just got back from our stay at Coral Rose and we are already hoping we can revisit next year. My husband and I and our 4 kids, ages 7 thru 15, absolutely loved it. The proximity to the gorgeous beach and having our own pool was fantastic. We had never visited the pandhandle before and found this beach to be every bit as beautiful as Siesta key without the crowds. This property is located in between Seaside and Rosemary Beach. There is a wide bike path just across the streets. Our boys rented bikes and they were determined to try as many different donut places between Seaside and rosemary beach that they could. We had a small issue with our pool heater and it took a little longer than we had hoped for for the rental agency to resolve it, but it ended up getting fixed. I would highly recommend this property to anyone looking for a perfect week at the beach. Leigh Ann, thank you so much for the feedback and thanks for staying with us. We are very happy to hear of your great stay with us and look forward to your return next year. Just contact us when you are ready to rebook the property. Thanks again! Becky, Thanks so much for staying with us. We are so happy to hear that you had a great time. Please give us a call when you are ready to return to the beautiful Gulf Coast! We had a wonderful week stay at Coral Rose. The house was the perfect size and was in the perfect location. Easy access to the beach and all amenities. The pool was great, but could have been a little cleaner. The construction next door was annoying and forced us away from the house for two full days due to the noise. Other than that, we had a great time! Courtney, We want to thank you for staying with us and are glad that you and your party had a great stay with us. The pools are cleaned two times a week. Typically on the day of your arrival and then again in the middle of your stay. We have spoken with the pool tech to make sure they are coming two times a week and ensuring the pool is clean. We do also apologize for the construction next door. Unfortunately the time of year that you stayed is typically when owners start repairs on their properties. We hope to see you again next year on the beautiful beaches of the Emerald Coast!